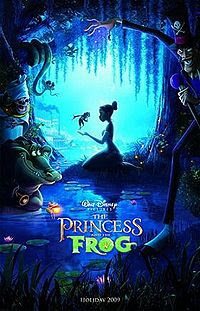 Watching "The Princess & The Frog" is an awakening experience, I felt absolute freedom and carefree-ness, as if I'm a little kid again as I watched scenes after scenes of colorful animation and listened to catchy melodies and songs. I like Tiana, especially when she became a she-frog. Whether she's a human being or a frog, she's still herself - strong-willed, helpful, and determined to get what she wants. She believes in working hard, not waiting for a prince charming. There's one particular scene - the scene whereby Tiana was heartbroken and snapped rashly at Ray (Firefly) by telling him that Evangeline, his sweetheart is just a faraway star, not a firefly - this really eats me inside out. Truth hurts, especially the kind that you hope is a lie, or the kind of which only you believe is the truth. One impressive point from the movie: Sometimes, in the course of our life, we are so adamantly stubborn and we think we know what we want. However, things happen as we grow up and we're forced to realize what we WANT might clash with what we NEED.